On October 17th, 2004, two men were stabbed at a residence located at 4657 Tajo Drive. The men were attacked by two assailants while playing pool in the backyard area of the residence. The suspects fled from the area in an unknown vehicle after the attack. 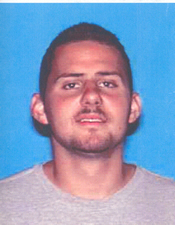 The victims, identified as Ramon Jesus Angel, age 22 at the time of the crime, and Michael Joseph Rivera, age 24 at the time of the crime, were transported to Goleta Valley Hospital by friends after the attack. Angel had a life-threatening stomach wound, and Rivera had wounds to his back and arm. The suspects and the victims are believed to be affiliated with a local street gang. The suspects in this stabbing have been identified as Martin Bueno, Hispanic/Male, brown hair, hazel eyes, 5’7″, 190 lbs., and his brother Frankie Bueno, Hispanic/Male, brown hair, brown eyes, 5’6″, 150 lbs. Both men reside in Santa Barbara. Sheriff’s Detectives served a search warrant on their residence at 414 W. Canon Perdido in Santa Barbara, but the two were not at the residence. There are no bail warrants for Attempted Murder for both suspects. If you have information related to this crime or the whereabouts of the suspects, please contact the Sheriff’s Detective Bureau, at 805-681-4150. The Santa Barbara Sheriff’s Department has outstanding No-Bail Felony Warrants for Frankie & Martin Bueno. If you have information regarding the whereabouts of Martin & Frankie Bueno, notify local law enforcement authorities or contact Santa Barbara County Sheriff’s Detective Bureau.